When OEM requirements call for faster delivery of small batch orders and reduced per-piece part costs, aerospace manufacturers of all sizes can successfully compete by automating machining operations. The Makino Machining Complex (MMC2) automated material-handling system has recently been updated to help aerospace suppliers achieve these goals with enhanced multi-axis processing flexibility. The updated MMC2 retains the same modular design and capabilities of its predecessors, but with a new pallet-transfer interface on the system’s rail-guided vehicle (RGV). This interface is able to handle the unique pallet designs used on Makino’s popular a61nx-5E 5-axis horizontal machining center. As a result, manufacturers are able to achieve spindle utilization rates upwards of 95 percent to further maximize the value of their a61nx-5E investment. Together, this system gives aerospace manufacturers more control of their workflow and the ability to adapt quickly to customers’ just-in-time needs for complex, multi-dimension part applications. The MMC2 is designed to accommodate up to 15 machining centers and four work-setting stations into a single system. Each system is able to hold up to 200 pallet stockers—stacked either one, two or three layers high—with a virtually unlimited variety of parts and fixtures. The system’s RGV is supported by a floor rail and upper-guide rail for enhanced stability and simultaneous, high-speed movement. The system’s work-setting stations (WSS) provide easy access for operators to load and unload parts either by hand or crane. Each WSS has 180-degree pivoting doors to save space and prevent a cluttered work area. The MMC2 can be equipped with optional workpiece washing guns. Users of the MMC2 frequently report spindle utilization rate improvements of up to 95 percent, leading to dramatic increases in production without adding staff or equipment. The MMC2 system permits users to virtually eliminate part setup time, reducing non-value-added time in their machining operations. By providing a continual flow of parts to the a61nx-5E, the system can run for extended periods unattended, including overnight and on weekends. 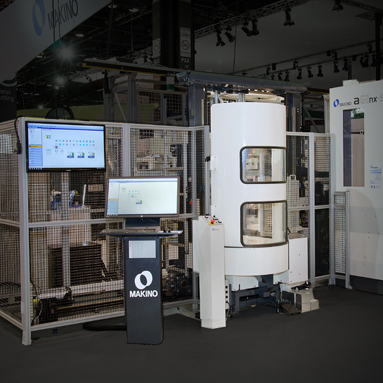 The updated MMC2 retains Makino’s state-of-the-art cell control software, the Makino Advanced System-A5 (MAS-A5). This Microsoft Windows-based software maximizes production output while monitoring multi-machine production requirements. The MAS-A5 main PC hard drive stores and manages all NC programs for optimum machine utilization, including NC programs that exceed CNC memory. In addition to NC programming, tool data, both in and out of the a61nx-5E machines, can be accessed and modified from the MAS-A5 user interface. A variety of tooling and part information file formats are supported and can be displayed to assist with part loading/unloading and tool-setting operations. A Tool-Life Predict function enables the MAS-A5 to gather tool-life data per NC program. It informs the operator of how long a tool is used in each NC program execution and how many spare tools are required in order to finish the current NC program. The MAS-A5 schedules work only for machines that meet tool-life and availability requirements for the desired process sequence. Interfacing with a tool presetter also reduces errors by automatically capturing tool-offset data, which can be transferred from the presetter to the MAS-A5 system control. The MAS-A5 maintains all processing steps required to complete a part. The system automatically schedules work-setting and machining operations according to the defined part process sequences, recognizing material and machine availability. Intermediate work-setting operations can be included in a process sequence to allow for setup changes. For more complex processing requirements, the MAS-A5 enables multiple jobs to be assigned for each machining process. With the MAS-A5, there is practically no limit to the number of fixtures and associated process sequences and offsets that can be logically assigned to an individual pallet. Using material availability and user-assigned priorities, the software automatically allocates work to each fixture. The MAS-A5 manages and schedules production orders for each part defined and lets the operator input a production start date and due date. Work can be scheduled dynamically using priorities set for pallets, process sequences and production orders as well as for multiple other methods. System priorities can be easily reassigned to meet changes in schedule or demand. The MAS-A5 also includes a production order capacity check that evaluates all orders and part quantities required and necessary cycle times. In addition, a chart displays system capacity on a daily basis. Several built-in reports are included with the cell controller, such as production data, tool data, results, alarm history and utilization. Alarm notifications can be configured to be automatically generated and sent via email. Custom report writing is also available. Looking to automate your aerospace manufacturing systems? Download Makino’s white paper, “Considerations for Seamless Integration of Automated Machining Systems,” to find out what considerations should be made before acquisition.